Samsung is one of the world's foremost electronics manufacturers with products ranging from drill ships to home appliances. Being involved in the computer industry, I would say that they are most well known for their TVs and computer monitors. Aside from a few issues with quality control their products are generally regarded as being of a high quality. Digital imaging is one area, however, that they have failed to thrive in. Despite numerous attempts to break into the market with something "new and innovative" they have been constantly eclipsed by the titans of optics, Nikon and Canon. Their brand name while not totally obscure has been relegated to "niche" status in the world of imaging. The NX10 is the latest effort from a company that refuses to be content with its "niche" status. Sporting an APS-C sized sensor in an ultra thin body, this camera attempts to play with the entry level SLRs while at the same time catering to the higher sales volumes of the point and shoot crowd. This particular market segment is becoming increasingly crowed as amateur photographers seek to leave the confines of their tiny sensors in hopes of better photos at higher ISOs. Panasonic, Olympus, Sony, and now Samsung have chosen this demographic to wage war in. Ultimately this is great news for the consumer as healthy competition results in good products at low prices. 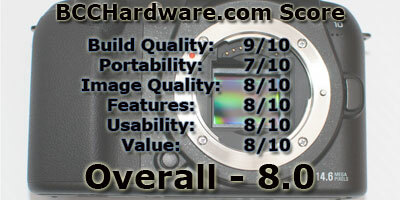 Does the NX10 have what it takes to play in this market?